20XX creates a strange problem for itself as the player spends more time in its world. While most games draw from a variety of influences, this one is deeply rooted in just one: Mega Man. However, any player who is a fan of that very particular gaming formula and wanted a few updated and upgraded features, like co-op and level randomization, is in for a real treat. From the start this game is platforming 101: dash, jump, destroy bad guys, and keep moving to the right side of the screen until you reach the end or die trying. Upon reaching the end of each level, players are greeted by a boss, who pushes the player’s skills as they fight to the death in a small room. If you have played platforming games all the way back to Super Mario Bros 2 on the NES you have seen this tried and true formula in action. 20XX lands the basics perfectly with responsive platforming, fun, vibrant environments, and upbeat music that makes the moment-to-moment gameplay feel full of life. Upon first glance, the aesthetics are where players will see (literally) the deep Mega Man roots. The player character is styled in a very similar fashion to the Blue Bomber, and her main weapon is an arm cannon. The resemblance is so strong that one of my co-op partners asked (without knowing 20XX’s title) if this was a Mega Man game. Even the bad guys seem to take a page from that franchise’s playbook, with many similar attack styles. If you’re playing by yourself, you can switch to a different character who wears red instead of blue and uses a sword instead of a ranged weapon, much like Mega Man X’s Zero character. No matter which character is selected the gameplay remains largely the same: push a button to attack, hold the button for a charged version of the attack, destroy baddies, platform to progress, and eventually reach the end to destroy the boss. Rinse, repeat. 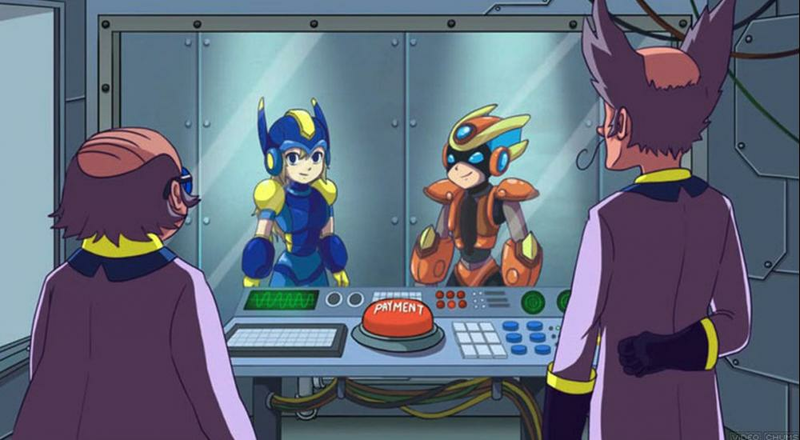 20XX’s biggest difference from Mega Man is the use of random generation in the levels. You hop into a random level to start and, if you complete it, can choose one of three environments to take on next. The levels themselves are randomly generated, but there is a set number of levels and bosses, and what order you complete them is up to you. You repeat this process until all the bosses are blasted to bits. The platforming in each world rarely tires since you have “never” played a level like whatever you’re playing through at that moment. This keeps things fresh for hours on end as in-level boosts, like health pickups, will be located in different spots on every playthrough. This also means that all of the non-boss bad guys you face will be in different spots leading to some exciting and panicked moments when a bad guy creeps out of a corner they weren’t in before. These pieces of gameplay are pushed further by health and NRG (or lack thereof) that carry through the levels and truly tricky platforming. The game balances this out with a bonus chest at the end of each level that typically holds a stash of health and NRG refills. However, the player is only awarded the chest if they get through the level (including the boss) fast enough, pushing players to make daredevil leaps and fight hard to survive. During most runs, the randomization of levels worked well, but there were a few memorable instances that the game literally had no reasonable way to progress. Things like laser walls that turned off and on simply too fast or obstacles that a player was “supposed” to jump over but they were placed too high made me jump through the damage-inflicting traps, as there was no other way around them, risking a swift death. If the player dies during a runthrough they go back to the game’s overworld where they can switch weapons (sword or cannon), game modes (such as time trials, bosses only and daily or weekly challenges), and buy upgrades before hopping back into another run. Upgrades in the overworld are purchased with computer chips the player finds in-game and come in three durations: permanent, findable, and single-use. Permanent upgrades only need to be purchased once and give the player perks like a permanent health boost. Findable upgrades must also be purchased once, but it then becomes available to found during the course of the game levels via in-level chests and enemy drops. Finally, single-use upgrades are only applied during the course of the player’s next run and will go away should they die. Although randomization is at the core of 20XX, when it comes to the bosses, that feature takes a back seat to pure power. These foes barrage players with endless attacks or hoards of minions until the player can deplete their opponent's health bar. If the player defeats them, they are given a choice between taking their fallen foes’ special attack for themselves, or a random upgrade that could increase their health or NRG meter (the resource required to use the special boss attacks once you have them). This can be a tricky choice as the special attacks are usually more effective against future bosses, but you might need to the health or NRG boost just to make it to the next one. I typically had two special attacks I would take no matter what as they were extremely effective against a different boss that I found to be very challenging. Again, this is all very Mega Man-esque. While you won’t face off against a completely randomized boss each time you play, they do offer some variation depending on when you decide to fight them. As you clear more levels, they will change up their game plan to include new abilities, such as some form of self-regeneration or more firepower. For example, I quickly learned that fighting the wheel-blade boss early on was straightforward, while taking him on in a later level meant he would split into two smaller versions of himself when he was “defeated.” This is great because it makes players think about how they progress through the stages and the order in which they take on these foes, and, if you made the wise choice to bring a co-op buddy along, this is shaken up even more since you and your friend’s attacks and fighting habits will be more effective against different bosses. Co-op is initiated through a portal in the game’s overworld and becomes an option as soon as a player finishes the opening tutorial. You can play with a friend locally or online, and there’s even online matchmaking if you want to team up with a stranger. Unfortunately, all of my co-op took place on my sofa as matchmaking meant waiting a long time and never being paired with a partner. This seemed to be due more to a small player community than any kind of network issues, though. 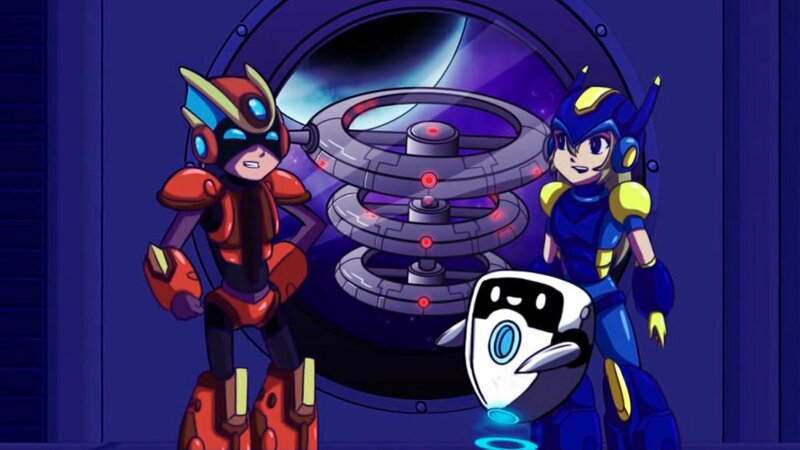 Bringing a partner along makes nearly every moment better in 20XX. Each player controls a different character so one of you can equip the sword and the other the hand cannon; foes both far and near will perish at your hand. Past the increased firepower, however, the game doesn’t change that much when there’s an additional player; you will still battle the same bosses and number of baddies, now more easily handled with you and your partner. Additionally, players are given their own individual upgrades at the end of each level, meaning that after defeating a boss I could take their power while my partner may opt for a health upgrade instead. Teamwork in this way kept us alive longer as I was better at platforming and didn’t need the health as much as they did. However, co-op also introduces some quirks of its own. First, currency found in levels that is used (in level) to buy things like health or NRG from a vending machines becomes a shared commodity. So if one player edges ahead they can spend the team's bank buying health for themself. This is only amplified by the second quirk; if you play locally, the screen always captures both players. This lead to unpredictable outcomes, as I (a platforming god) often got ahead of my partner. Instead of the screen splitting so my co-op partner and I could both keep advancing at our own pace across the platforms, it just stayed with me as I kept moving ahead. Eventually, it panned out until the platforms my partner was on started to disappear. This means if one player gets too far ahead the other will literally lose the ground they’re standing on without warning, leading to some terrifying moments. The game tries to circumvent one player lagging behind by letting players teleport to each other, but doing so takes NRG, which is in limited supply and usually used for activating the special powers granted from bosses. This is not an ideal solution and makes one player feel like they’re forfeiting their power for simple survival. Figuring out why a video game works well is quite a challenge, and 20XX has taken the pieces that matter from a well-known (and beloved) action-platformer and built something new with the well-worn parts. 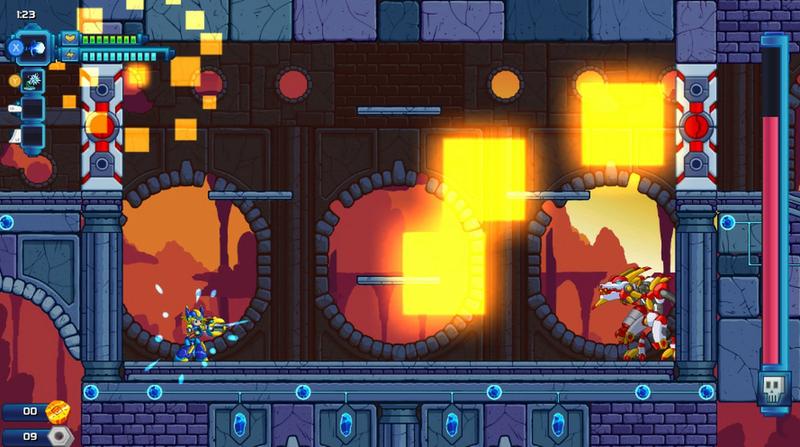 While there is nothing truly revolutionary here, and the co-op brings its own bothersome quirks, upgrading the classic Mega Man formula with randomized levels, rogue-lite progression ideas, and co-op elevates already strong gameplay mechanics into a title that feels modernized and refreshed. 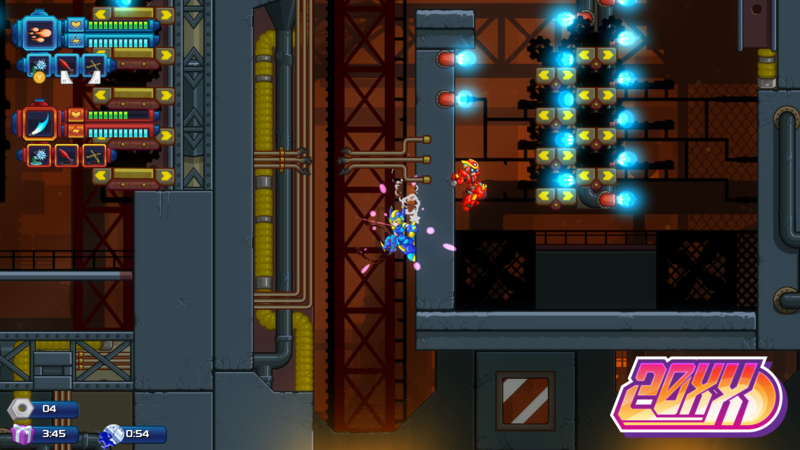 The Co-Optimus Co-Op Review of 20XX is based on the PlayStation 4 version of the game. A code was provided by the developer for review purposes. Page created in 1.0947 seconds.